Asynt was formed in July 2003, the aim being to develop, supply and support new and novel products and services that would become core to the chemist?s future needs. Our concept is to provide completely new solutions for chemists as well as a range of supporting products unique to us. Since inception we have developed the DrySyn range of products (Launched March 2004) as well as successfully introducing our partner company PharmaCore?s custom synthesis services into the European market. We have a 100% commitment to investing in new products and chemistries and plan to launch new ideas on a regular basis. All of the products we develop are from the chemist?s needs and are developed by real chemists. Our current team has over 25 years of experience between them in providing, developing and supporting novel and new world leading products for chemists. Asynt would like to thank all those chemists who have supported us from the outset, without whom our success would have been limited. Asynt announces “Asyntise” a consultation, design and manufacture service whereby the company collaborates with scientists to create practical tools to help fulfil their research needs. Asynt reports on an increasing demand for bespoke glass laboratory reactor systems, optimised to meet the exact demands of an application or project. Asynt reports that it has supplied Redbrick Molecular Ltd with a wide range of synthetic organic chemistry equipment for its new environmentally responsible laboratory. 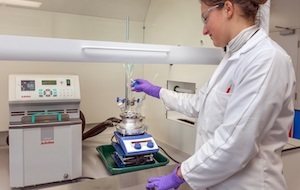 Asynt reports that it has supplied Redbrick Molecular Ltd (Sheffield, UK) with a wide range of synthetic organic chemistry equipment for its new environmentally responsible laboratory. Asynt announces DrySyn UNO - a versatile new heating block system designed to enable chemists to perform heated and stirred experiments in single flasks and vials. Asynt has introduced a new attractively priced starter kit based upon its DrySyn Classic heating blocks which are used in thousands of laboratories worldwide. Asynt reports on an independent evaluation, from a leading UK university, detailing the performance of the CondenSyn MINI air condenser for safe use in their research and teaching laboratories. Leading multinational life sciences tools and diagnostics developer - QuantuMDx has invested in the Asynt professional range of non-ducted laboratory filtration and fume cabinets which sit directly on benchtop surfaces. The DrySyn® SnowStorm ONE from Asynt is designed to provide reliable temperature control of exothermic reactions. Asynt has announced a new post-pump adapter kit that enables its CondenSyn air condenser to be used as an effective exhaust trap for laboratory vacuum pumps. Asynt announces an updated version of its best practice guide developed to enable laboratory personnel to more safely use heating block systems. The Asynt MultiCell is a lightweight, high pressure parallel reactor designed for undertaking experiments including carbonylation, hydrogenation, catalysis and supercritical fluid reactions as well as air sensitive material studies. 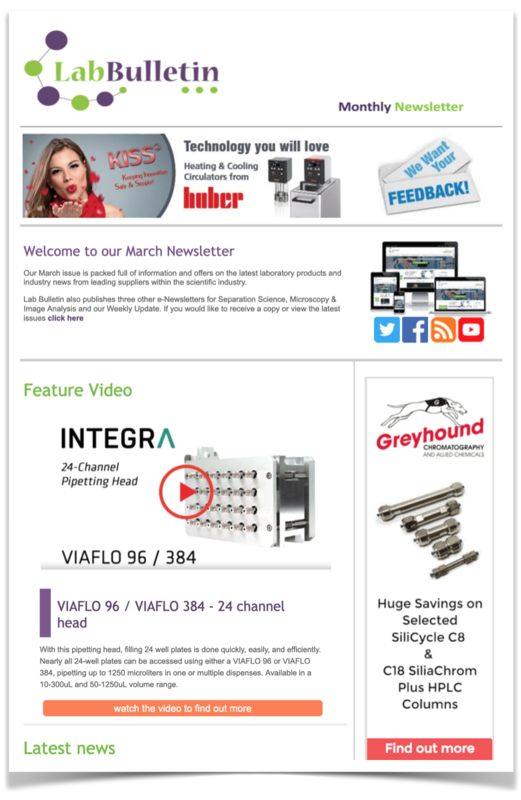 Asynt has produced a new report that compares the thermal performance and advantages of vacuum jacketed versus non-vacuum jacketed reaction vessels. Asynt reports on its collaboration with the Department of Chemistry, University of Bath (UK) in the development of a novel mesoscale segmented flow reactor. New scientific evaluations from the Department of Chemistry, University of Uppsala (Sweden) and the Australian National University (Canberra) report on their testing of the performance of the Asynt CondenSyn air condenser versus traditional water-driven condensers and an alternative commercial air condenser in “real-world” laboratory conditions. Asynt's DrySyn Heating Block range now has new options enabling scientists to conduct precisely controlled heated/stirred experiments in 3 Dram vials, 20ml Scintillation vials and 2ml HPLC sample vials. Asynt has introduced new reaction inserts for its DrySyn Heating Block range enabling scientists to now conduct precisely controlled heated/stirred experiments in 3 Dram vials, 20ml Scintillation vials and 2ml HPLC sample vials**. 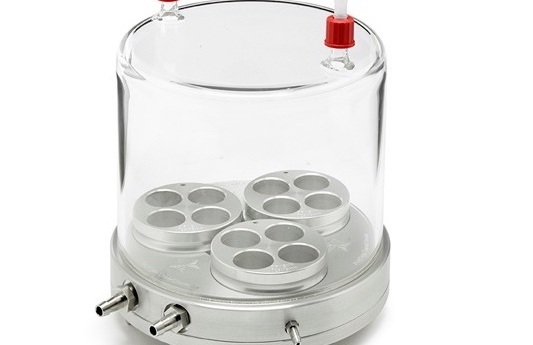 Designed by chemists, Asynt ReactoMate Controlled Laboratory Reactor (CLR) systems enable precise control of reaction variables, simple manipulation of vessels and connected apparatus, and the safest possible working conditions. The Asynt CryoSyn is a unique on-demand generator (available in 10, 20, 40, 60 & 120L capacity models) which generates liquid nitrogen and nitrogen gas for industrial, medical, food and agricultural, biological and general laboratory applications. Asynt announces that Rapid Powders Ltd. (Stoke-on-Trent, UK) has been using a PressureSyn High Pressure Reactor to undertake series of process experiments using small amounts of precious materials to produce optimally functionalised polymers. The ReactoMate "Datum" is a new compact benchtop Controlled Lab Reactor (CLR) system from Asynt that offers the flexibility to accommodate reaction vessels from 100ml to 5 litres. Asynt in conjunction with Biochromato (Kanagawa-ken, Japan) have developed the new DrySyn Spiral Evaporator which enables scientists to evaporate tubes directly in DrySyn synthesis blocks up to 12 samples at a time. Asynt has announced that all models in its popular DrySyn Heating Block range will now come with permanently attached, heat resistant, lifting handles to safeguard users from coming into contact with hot surfaces. Asynt has developed DrySyn NMR Heating Blocks to enable safe, effective and uniform heating of up to 10 NMR tubes on a conventional hotplate stirrer. Asynt reports on how chromatography specialists - Reach Separations Ltd. are benefiting from the installation of an onsite nitrogen generator at their laboratories in Nottingham, UK. The ChilliBlock from Asynt is a new modular system purpose designed for precise, controlled cooling and heating of biological samples in microplates, vials and Eppendorf tubes. Using a patented vacuum-assisted vortex concentration technology, the Smart Evaporator from Asynt sets a new standard for labs tasked with drying sample tubes and vials. Asynt has announced that its DrySyn Heating block range is now used by over 1000 establishments worldwide including many leading universities and highly respected companies. The Asynt CondenSyn is a new high performance air condenser for synthetic chemistry experiments that requires no cooling water for operation. 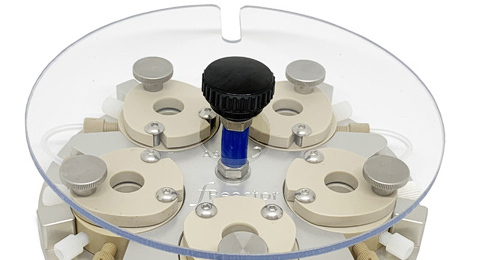 Asynt hotplate stirrers are designed to offer synthetic chemistry laboratories a combination of affordability, top build quality and high performance without compromising on safety. Asynt announces a new range of high quality, non-ducted fume cupboards designed to sit on a standard laboratory bench. Asynt has formed a partnership with Asahi Glassplant (AG!) to supply their range of high performance reaction vessels alongside, and incorporated with, its popular ReactoMate Controlled Lab Reactors. Asynt won this year’s Lions’ Lair competition, which took place at Lab Innovations on Wednesday 5 November. Asynt reports on how the School of Chemistry at Monash University in Melbourne, Australia has invested in a range of its DrySyn MULTI heating block systems to support its ground breaking synthetic research in photovoltaics, water splitting and nanoimaging. Sygnature Discovery (Nottingham, UK) has been using an Asynt DrySyn SnowStorm system to perform low temperature reactions which have traditionally been difficult to undertake reproducibly on a small to medium scale. Asynt has developed a new adaption of its Vortex overhead stirrer, called the Vortex Blend, specifically to cater for the requirement of scientists who need to test new formulations and blends in parallel. Asynt has developed a version of DrySyn heating block purpose designed to allow scientists to perform safe, productive heating and stirring experiments with pear shaped flasks commonly used with rotary evaporators. Asynt in conjunction with the Department of Chemistry, University of St Andrews (UK) and Advanced Chemical Safety Inc. (USA) have produced an 8-page illustrated document to provide laboratory staff with an IN BEST PRACTICE GUIDE to safe use of heating block systems. The new ReactoMate Pilot jacketed reaction vessel, from Asynt, offers precise control of reaction variables, a powerful direct drive overhead stirrer and excellent reaction visibility even with the vacuum jacket option. Asynt has designed its range of products for parallel synthesis to share standard parts (inserts) for reaction tube, vial and round-bottom flask based reactions. Asynt's Lab Safety Shield has been designed to neatly fit around popular brands of stirrer hotplate to provide protection for chemists from draughts, splashes, aerosols and spills. A Simple, Cost-Effective Route to Parallel Crystallisation Jun 7, 2012 Asynt has supplied the Wilson Structural Chemistry Research Group at the University of Bath (Bath, UK) with a custom DrySyn heating block system. DrySyn multi-position heating block gets a great reaction! Feb 8, 2011 The DrySyn MULTI-M from Asynt converts any standard hotplate stirrer into a reaction block for three flasks or up to 12 vials. Providing excellent heating and stirring performance but without the high risk of fire and toxic fumes from an oil bath, DrySyn heating blocks help laboratories create a safer, cleaner and more efficient working environment. Asynt launches storming new low temperature reaction system Jan 24, 2011 DrySyn SnowStorm, Asynt's cost-effective solution for low temperature reaction chemistry, offers active temperature control without ice formation and the ability to cool and stir up to 12 reaction tubes in parallel. The new DrySyn SnowStorm is ideal for a wide range of applications in chemistry, process development and biology. Asynt DrySyn - One Size Fits All Laboratory Heating Sep 1, 2010 The Asynt DrySyn® range of laboratory heating blocks offers the ultimate in flexibility for heating (and cooling) round-bottomed flasks, tubes and vials. These efficient heating blocks can now be used with any hotplate stirrer regardless of shape or size and offer controlled heating for single or multiple reaction vessels with volumes from 1ml to 5000ml. New Flexibility for DrySyn Laboratory Heating Systems Aug 10, 2010 Two new configurations for the successful DrySyn system of laboratory heating blocks add even more flexibility for the pharmaceutical or process chemist and provide economical synthetic chemistry solutions for the teaching laboratory. Asynt DrySyn Reaches Out to Aspiring Chemists Jun 28, 2010 Newcastle University's new Outreach Laboratory was recently opened by the Vice Chancellor, Professor Chris Brink. The Outreach project aims to inspire and encourage young people to gain and maintain an interest in chemistry and it is anticipated that over 3,000 children and young people from local and regional schools will visit the Outreach Laboratory each year to help them realise their potential in science. New High Pressure Reactors from Asynt May 12, 2010 The capabilities of the remarkably versatile DrySynTM range of laboratory heating systems have now been extended to include reactions carried out at high pressure and temperature such as hydrogenations. Novel Filter Vials Simplify Sampling Procedures May 5, 2010 SINGLE StEP Filter Vials from Thomson Instrument Company (Oceanside,CA) are an elegant, simple solution to sample blockage problems in HPLC, LC-MS and similar techniques, and are now distributed in the UK exclusively by Asynt Ltd of Cambridge.